We use two types of devices for our systems, a plug’n’play device and a hardwired device. To determine which is appropriate for your situation, we will consult with you on your needs and the outlay you wish to make on your installation. We will spend time discussing your requirements and explaining the advantages, disadvantages and limitations of both types of devices. 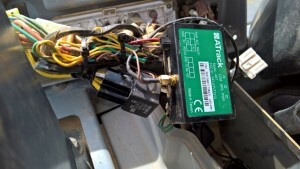 The two choices of hardware for your vehicles, are a simple plug in device that uses the vehicle’s OBD socket to connect to the vehicle’s electronics. The other type is a more traditional approach where the device is wired directly into the vehicle usually behind the dashboard. For most plant use, the hard-wired device has to be used as very few plant equipment has an OBD socket. The OBD modem is a recent introduction into the GPS marketplace brought about by sophisticated developments in the electronics and reductions in costs. 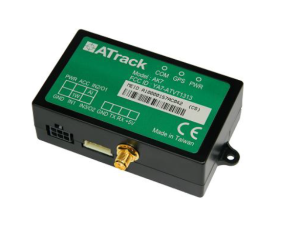 We use the Atrack OBD modem as shown on the right. 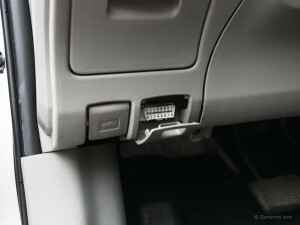 This type of modem typically fits into a socket which can be found under the driver’s side of the dashboard, an example of such a socket is shown here. These types of modems only take seconds to install and do not require the assistance of an installer or auto-electrician and so installation is much less expensive than the traditional hard-wired modem. Hard-wired modems typically offers more security than plug-in type modems as they are more difficult to remove either deliberately by a thief or accidentally by a driver. 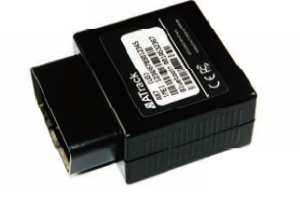 Like the OBD modem we use Atrack devices such as the one shown. These types of modems can be installed in all types of vehicles or plant but installation is required to be undertaken by an experienced installer to ensure their correct operation. They can also be installed in compact spaces often found on excavators, as shown on the left.